dull roar: Wind yourself up a big hank o' Me! I've always harbored this weird little... vanity, I guess you'd call it, wherein I secretly wish for things to be named after me. Perhaps a song (I looked SO HARD in high school for songs about girls named Alex. There aren't many) or a newly discovered disease, or....dare I to dream?.... 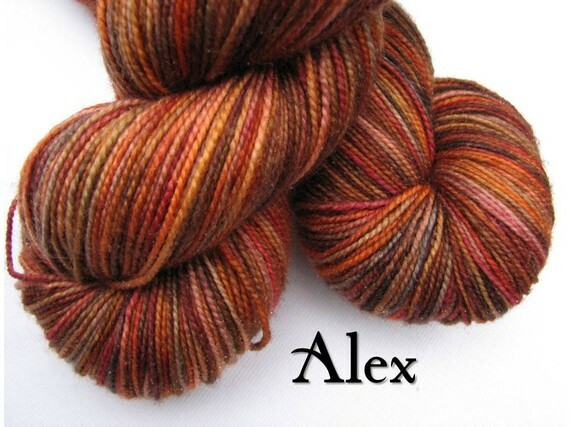 a colorway of yarn. You can read more about it on the Black Trillium Site and see Star's gorgeous color too! I've already ordered one of each. Heh. I love when products are named after people! Great colors. Thought I'd finally say hello. I really enjoy reading your blog; you're super funny. I also admire your knitting and love the gorgeous colors you choose. You're beautiful! And so is the yarn. What a great idea.